Places to see in Martam: Martam is known for its lush vegetation, majestic views of the Mountains, quaint villages, nature walks and forests harbouring thousands of birds, butterflies and orchids. Martam and its surrounding areas are excellent locations to view birds and butterflies. The place truly offers visual splendor to the naturalists. Nearby attractions of Martam: The most popular destinations near Martam are the Rumtek and Sang monasteries. You can visit the Rumtek Monastery, located around 6 km from Martam. 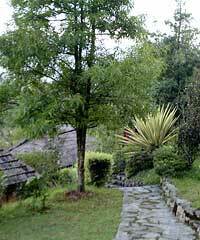 There is also the Nehru Botanical Park, near the monastery. Then you can also visit the Sang Monastery, located in a village town called Sang, 6 km away from the resort. Gangtok is also nearby and you can make a day trip to this capital city for enjoying its colourful culture. Gangtok is admired by a number of sightseeing attractions, including Chorten Monastery, Ropeway, Mahatma Gandhi Marg, Tashi View Point, Enchey Monastery, Ganesh Tok and others. You can also enjoy a day-trek into the Fambong Lo Wild Life Sanctuary along the forest area of the village featuring varieties of trees and vegetation. While trekking, you can savor the sight of some beautiful birds, butterflies and some wildlife, which include monkeys, barking deer, caveats, pheasants, mountain goats, wild rabbits, porcupine and more. There is also a lake and a viewing tower on the hilltop offering a majestic view of the Kanchenjunga range. After leaving the forest, you can walk along the Bhutia villages and visit the local monastery. 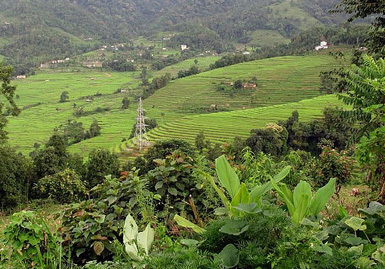 Things to do in Martam: Enjoy a nature walk along the picturesque scenic landscape of the Martam village. You can also hire a local guide who will acquaint you to different herbs and plants used by the village folks in their daily lives. Observe the farming technique and the animal husbandry practice of the villagers. You can also spend some time trying your hand in angling at the rivers or streams with bamboo fishing rods. You can also organize picnic by the riverside. There are also arrangements of mountain cycles to move around the village. 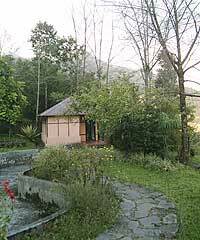 The serene surrounding of the village resort is ideal for conducting meditation, retreat or religious courses. You can also invite the Buddhist teachers to your place to offer you an introduction into Buddhism. Best time to visit Martam: Tourists are welcomed at Martam throughout the year. Lodging and dining facilities in Martam: Martam Village Resort offers excellent accommodation at Martam in 14 thatched cottages built in traditional style to blend with the surrounding village. 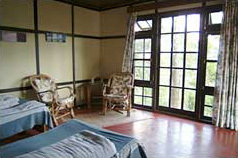 The cottages have twin bedded rooms with large picture windows framing the spectacular countryside. Each room has attached bath with modern facilities. Great care has been taken to blend the resort into the village, to maintain the ethnic style and culture of the area. To remain rustic, yet, provide for a pleasant and comfortable stay. The rooms do not have any TV because the resort wants to encourage outdoor activities associated with nature. The Martam Village Resort is our Preferred Property, so you can avail discounts if you book it through us. 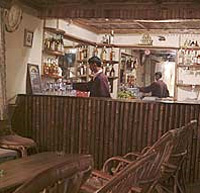 At the attractive and cozy dining hall and bar of Martam Village Resort, local food and drinks are served. 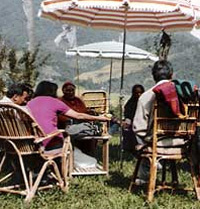 The guests are offered the opportunity to taste the forest produce such as nettles, ferns, bamboo shoots, mushrooms etc. (seasonal), which are gathered by the local people, fresh from the forest, combined with the locally grown rice. The local drink “Chang” is also served in freshly cut bamboo. Besides this, Indian, Chinese, Continental cuisine is also on the menu. Transport arrangements for guests to and fro from Martam can be arranged by the resort on prior notice. Local guides for the local treks and village walks are also arranged if required. Guests can also enjoy facilities like Laundry, Currency Exchange, Travel Desk, Library, Car Parking and a gaming room with a TV.